Hey, y’all. This Fall, I will be participating in the ASPCA Virtual 5K. I am excited to be participating and honored to be raising the awareness and funding to support the ASPCA’s programs. Since the age of three, animals have always been a part of my life and I’ve always connected more with animals than people. I’ve become an Animal Control Officer to do what I can in helping animals in need and am very happy doing so. But I began feeling like what I was doing wasn’t enough. Almost five months ago, I decided I would become a pescatarian (can’t give up fish, sorry) and have slowly been eradicating from our household products that are tested on animals. On my 23rd birthday, I decided I would start being the best me that I can be…a “me” that I am proud of. I’ve decided to participate in the ASPCA Virtual 5K as part of my betterment. It helps me work towards my goals of being healthier and doing as much as I can for animals. I’ve decided to drag my Daisy Leia, my 10 month old German Shepherd/Husky mix, along…as she is my unofficial Emotional Support Dog and essentially will be my accountability buddy. We will begin running everyday in preparation of running 5K. The 5K is to be completed between the dates of October 28 – November 12. I do not have a set date at this time, but I will advise when I do figure out when. I have yet to decide where to run, but am open to suggestions in the Charlotte, NC/Concord, NC area. My goal is to raise $300 for the ASPCA. It is not a large goal, but it is something. I know a lot of people are passionate about animals, as much as I am. If y’all are feeling charitable, please donate anything you feel like. I will not pressure people to donate if they do not feel like it. 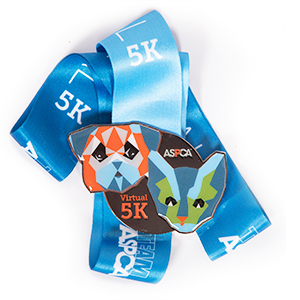 If you are interested, you can even participate in the ASPCA Virtual 5K yourself! Your donation will help the ASPCA provide life-saving programs and services to millions of animals nationwide. I appreciate your help as we fight to give abused and homeless animals a second chance at life.